Main Point: Leaders do what’s right! We had so much fun celebrating White Warthog day together at Camp Wannastay! This week, our friend Brownie Bear taught us about a man named Nehemiah. After hearing about the walls of his hometown being torn down, Nehemiah returned to fix the walls with the people in his hometown. 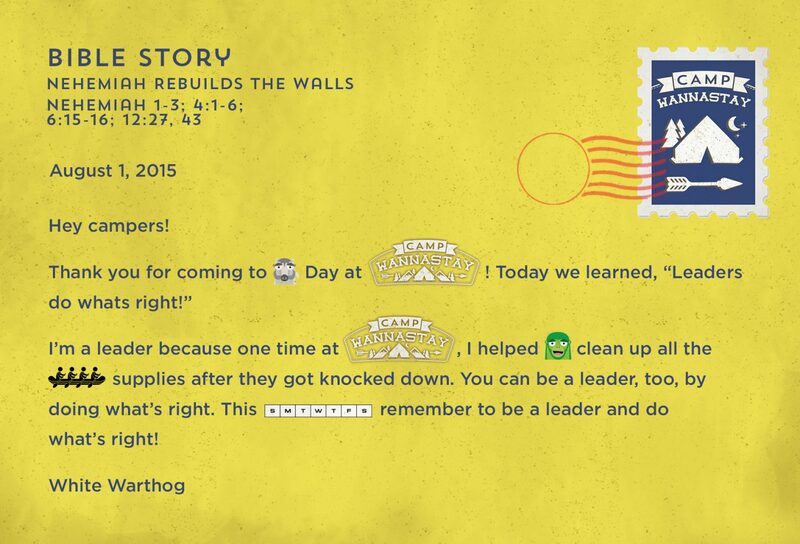 Nehemiah was a leader because he did what was right, and we can be a leader like Nehemiah, too! We can do what is right by sharing toys, hold open doors for people, or doing chores without complaining. We are partnering with Newspring Church and using their Camp Wannstay video curriculum.To learn more about KidSpring, visit https://newspring.cc/kidspring. We can be a leader to our friends, family, and others by doing what is right. Look for ways to do what is right every day! 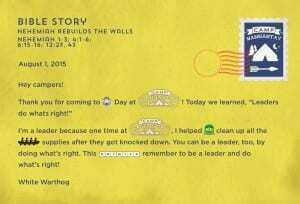 This week, we received camp mail from our friend White Warthog about how was a leader by doing what was right. Join us in helping your child learn Hebrews 13:7, our camp memory verse. Children can recite this verse each week during Camp Wannastay to collect a prize from the Camp Canteen.